Bullying is always an issue revolving around our society. Many people would have a painful experience, including myself, be it during school times or even when I'm out in the society working. 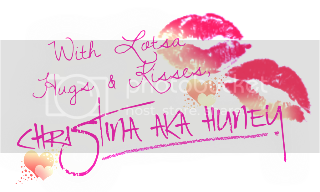 Bullies can be your boss, your coworkers, teachers, coaches, boyfriends, girlfiriends or even you parents! 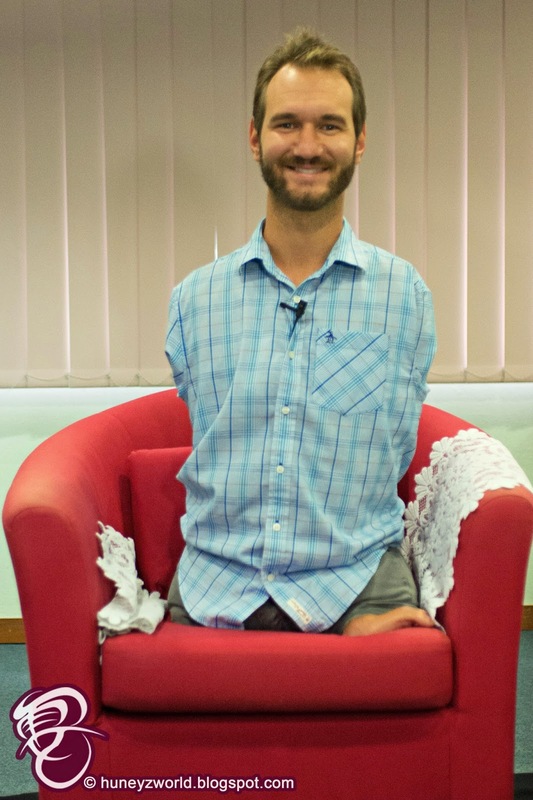 Nick Vujicic (pronounced as Vooy-Cheech) is such an inspiration for those being bullied, bringing hope in his speeches and after his press conference for his new book - Stand Strong, I know no matter how much obstacles I face, I must always have faith and press on! 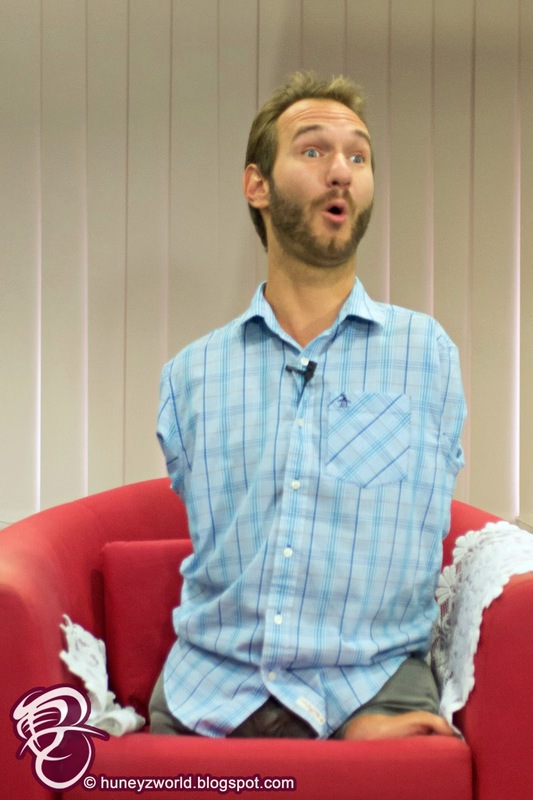 Being without arms and legs, being different, has made Nick an easy target for bullies since young. He suffered from loneliness and depression, hated God then for making him the way he is and the fear of losing his parent's help, caused him to attempt suicide at the young age of 10. 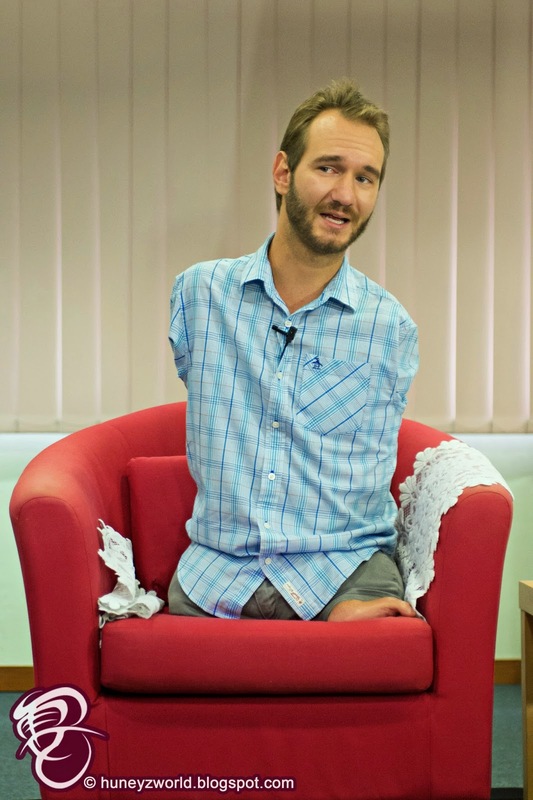 Everything got tougher when his family moved from Melbourne to Los Angeles, not only was he the only kid in school with no arms and legs, the only kid in a wheelchair, his Australian accent also made it so difficult for him in school. Nick took hold of the fact that God had a purpose and plan for his life and never looked back. 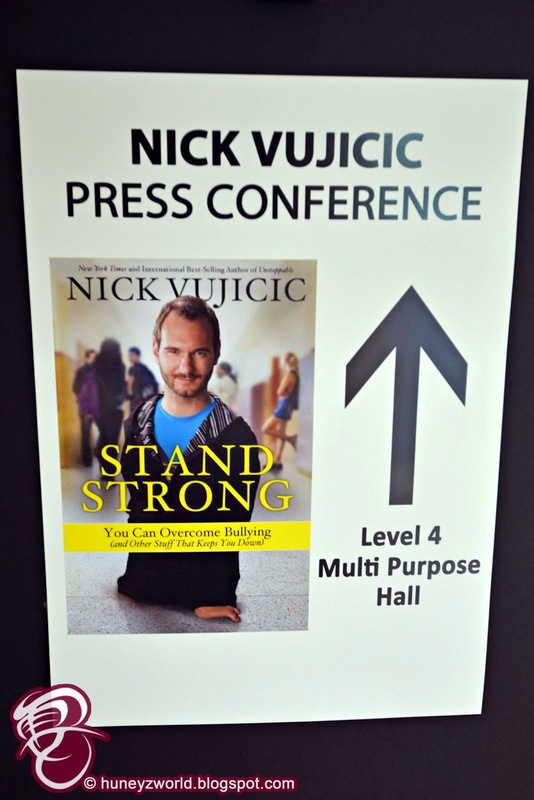 In his latest 6th book, Stand Strong – You Can Overcome Bullying (and Other Stuff That Keeps You Down), Nick has sent a powerful message for anyone who has ever been bullied. When asked about protecting his year-old son, Kiyoshi, he said that he would not mind if he gets bullied in the future. In Stand Strong, not only did Nick shared about his personal experiences, biblical principles and practical advice that will help you to bully-proof your life, he also got us to understand the mindsets of bullies (sometimes they are the ones who are in need of help) and provides us with strategies for building up our bully defense system from the inside out. 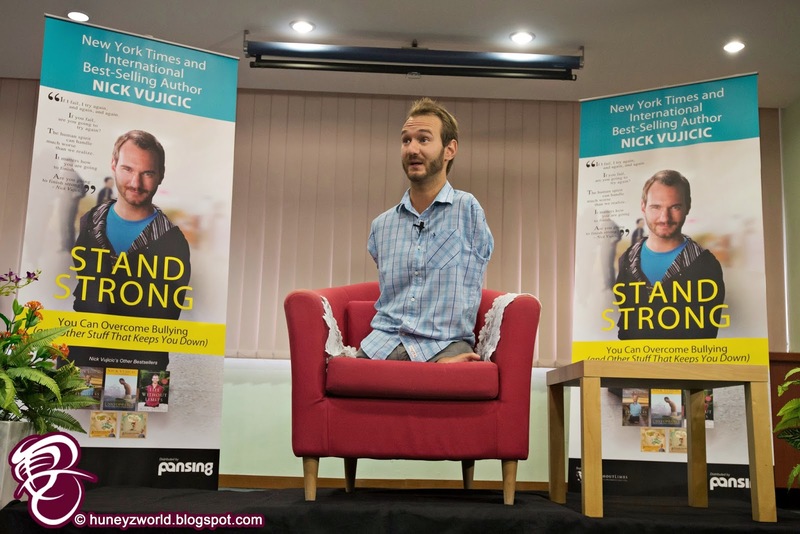 Nick reminds us that bullying is a global epidemic – but we have the power to change the world! In 2012, Nick visited a school in Hawaii to discuss bullying. A year later he received a letter from the headmaster saying that his visit had transformed the school! In the year that followed, not a single incident of bullying occurred at that school! "Being bullied, sadly, is as common as catching a cold or stubbing your toe. I travel all over the world talking to young people about this issue. No matter where I go, bullying is a major topic of concern. Teens in every school in every town and every country tell me they have mental, emotional, physical and spiritual pain because of being bullied." 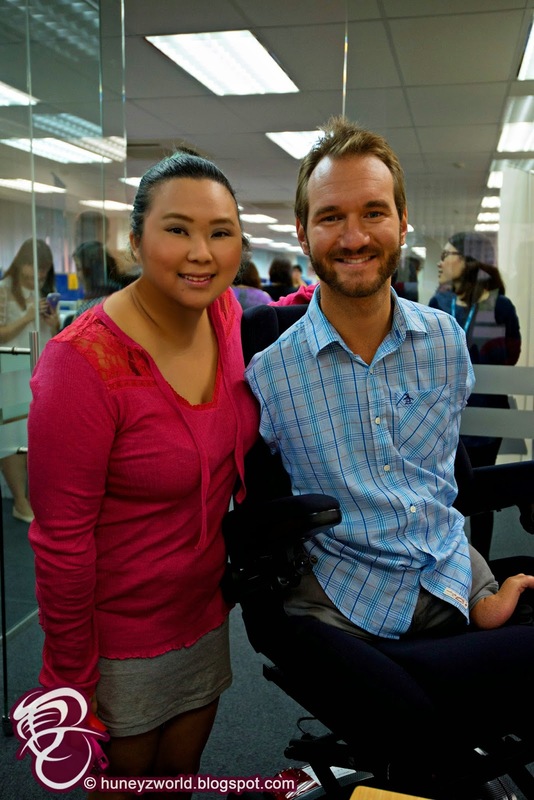 A Nick Vujicic Movie A movie of Nick Vujicic's life is in the works. It is scheduled to be releases in the United States in 2015, produced by 10 Elephants Pictures. It is a film production housse that he's set up with some partner. "I'm not sure if I will be acting in it, or if they will use my body and CGI the actor's head on! But we do have a budget for a Class A actor and Class A director." Nick proposed to Kanae on a boat, and put the ring on her finger with his mouth! 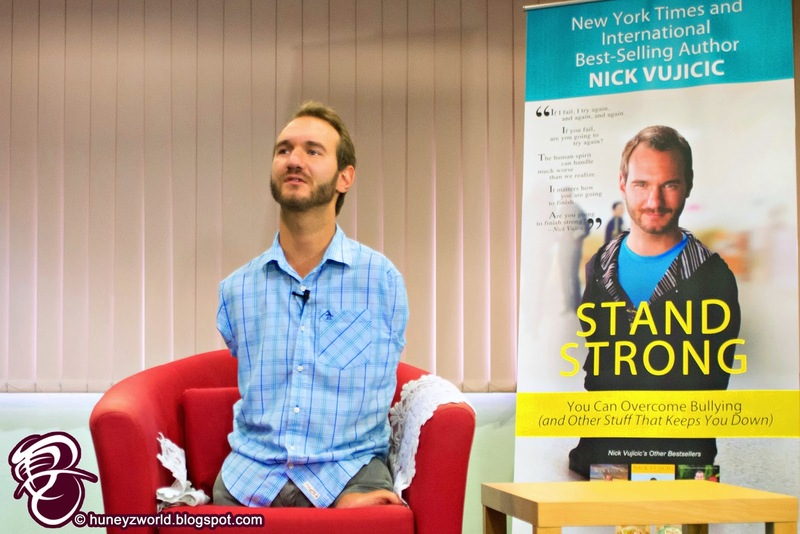 Stand Strong is Mr Vujicic's sixth book and is aimed to help teenagers and adults handle and fend off bullies. 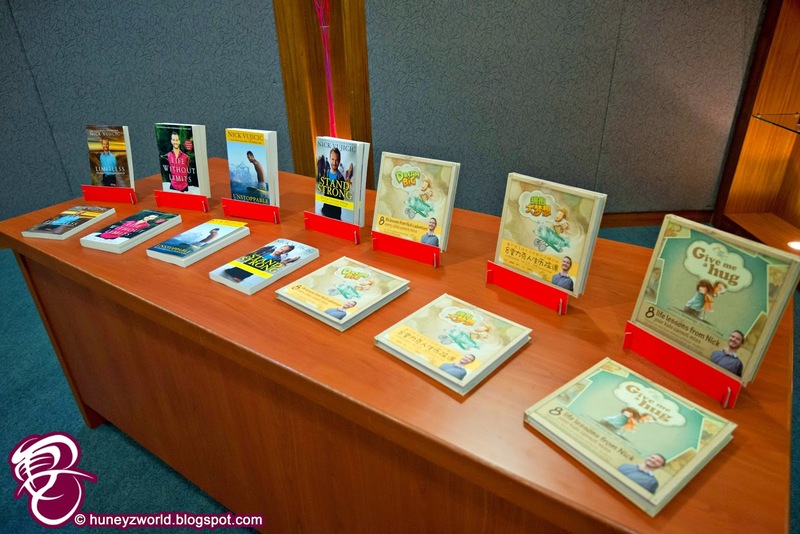 The book is available at all major bookstores and 5,408 copies have already been sold here, propelling it to the top of the national best-sellers list for the past four weeks. After the press conference, we followed Elim Chew of 77th Street for a private catch up. Nick and Elim have been friends and she was presenting a "Hope of One Voice" T-shirt to him. "Hope of One Voice" is a original song written by Elim after a vision she had. In the vision, she said she saw children clinging on to floating logs and crying out for help after an earthquake and that spurred her to write down what she saw and she ended up penning the lyrics to Hope Of One Voice. A specially-designed T-shirt was created to support the Hope Of One Voice Rebuild Philippines initiative and is on sale at 77th Street. 20% of the sales from the merchandise will go to the Apl.de.Ap Foundation for this cause. 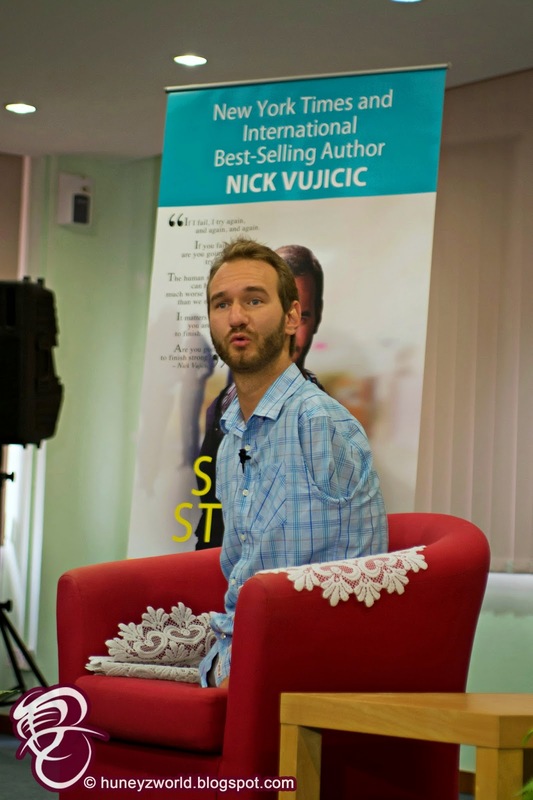 So do support the cause and not forgetting to support Nick Vujicic and spread the word to stop bullying, make the world a better place! Can H ZETTRIO Perform In Singapore Soon?! Shop At VivoCity This GSS!